The Nintendo Wii has given us a game that is unlike any other. With new Wii games popping up almost every day, it seems that any video gamer will find something that they enjoy. Many sports enthusiasts love the games that Wii supplies no matter what game it is they are playing. I love kicking back a couple of cold ones and playing pool, and thanks to Nintendo it is now possible to do the same thing in your own living room. There are not many accessories and a limited number of games, but each Wii pool game can be like spending time at the local pool hangout. 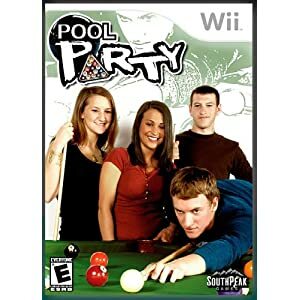 The Wii Pool Party game is a multi-player game that features more than ten different variations of billiards. There are different versions of Rotation, Snooker, 9-ball, and 8-ball to choose from and they even give you ten different environments to choose from to play in. Pool Party also offers choices of themed cues and ball sets. While this offering from Wii may not have the greatest music and is not the easiest of the Wii sports games to play, the variety of games it offers and the technical aspects make this a game I could get into on a lazy afternoon. This game was released in 2007, which is why it may not stand up to the rest of the Wii pool games. This is an upgrade to the Pool Party game, and if you enjoy playing pool this may present a better choice. It is also, like Pool Party, a one or two player game. Tournament Pool features the games of 8-ball, 9-ball, Bar Pool, and Snooker. The game includes what Nintendo calls “real pool physics”, with the motion sensing Wii controls providing the feeling of playing pool at your local pub. All games are played by regular tournament rules. 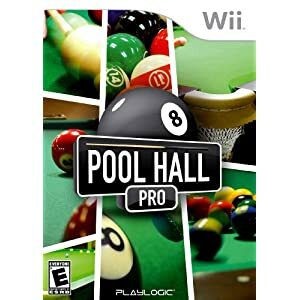 The graphics are also much better with this game and I would recommend that anyone who enjoys billiards and enjoys Wii add this game to their collection. This game was originally released in March of 2009. Pool Hall Pro features ten different variations of pool and the ability to create your own character. This is an interesting pool game because there are five different variations of gameplay to choose from. In the “World Tour” mode you can upgrade your crib by beating opponents and collecting cash or unlocking collectibles. In “Tournament” mode you will travel the world playing all different styles of pool in some fascinating venues. This is also a multi-player game, and when playing solo there are four different levels to choose from. This is a game that I found interesting to play and would recommend it to Wii users who want to add some billiards to their repertoire of Wii sports games. This game was released in June of 2009. 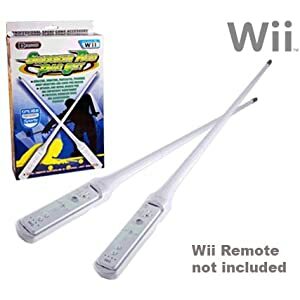 It seems that the only accessory available for these Wii pool games is a Wii Pool Stick. This is a really cool addition to the game, as it is made similar to a real pool cue. It can be as long as 26.5 inches and has a cradle for the Wii remote included. To protect from doing any damage the tip of the stick is made of rubber. It is light in weight and provides an authentic feel to it as well. These pool sticks can also be bought in sets rather than just buying a single stick. While the best choice really relies upon personal preference, I found that Pool Hall Pro was my favorite choice. The graphics are very good and the choices of modes that you can play in make it one of the most interesting pool games you will find for any system. 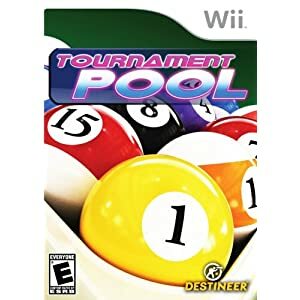 The Wii Tournament game was also pretty enjoyable, but the Pool Party game just doesn’t seem to have the quality that the other two choices present. Using a Wii pool cue can also help add to the overall virtual reality of the game and is a unit that is easy to handle and works well with the games.